COTONEASTER SIMONSII. Hedging Plants, Trees, Shrubs and Conifers. Cotoneaster simonsii display hedge at the Garden Centre. Click here for pictures of young plants. 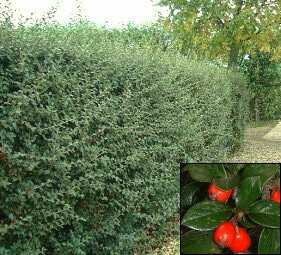 Semi-evergreen hedge with glossy, small, dark green leaves, some of which turn red in autumn and winter. Small white flowers, tinged pink in June attract honeybees and bumblebees followed by persistent red berries in autumn good for wildlife. Shade tolerant. HEDGE Trim back vigorous shoots after flowering and trim to shape in February. For hedges 3-5ft (0.9m-1.5m). Plant 12-15ins (30-38cm) apart. SHRUB 7ft x 4ft (2.1m x 1.2m). Makes an attractive specimen shrub which will be loved by pollinators in spring and hungry wildlife in winter.